How many Business plans do you need? How many Professional plans do you need? For users in the EU, prices include tax. You can access up to 5 times. How do you bill in Sinnaps? The price given for each plan corresponds to monthly usage of the app, which is billed annually. If you want, monthly billing is also possible. Don’t forget that each user can use the plan which best suits their needs. There may even be some users on a project who are paying and others who aren’t, depending on their needs. What do I save by paying annually? Almost a month and a half for free, depending on the plan you want. Select the plan that you are interested in, and see in detail how much you save depending on your payment preferences. When is the payment charged in my bank account? Payments are charged to your credit card or paypal account as soon as you purchase the plans. The exact time will depend on your card provider however, if the payment has been performed is because your bank has already approved the purchase and ensured the funds for the payment. Each plan will be charged and billed individually, performing separate transactions for each plan. What happens if I acquire a professional plan and then regret it? At Sinnaps we are convinced of our product. So if you change your mind during the first 30 days after purchasing your plan, we will refund your money. I am an SME: what can I do with Sinnaps? You can manage and plan several projects simultaneously, control costs, create budgets and project reports, manage authorisations and access, work on private projects, attach documents, invite clients or outside partners, communicate with your team from the app itself, etc. For further information, see characteristics of Sinnaps. Can I plan for free for unlimited time? Yes. Free Plan allows plan and manage up to two simultaneous projects all the time you need. No trial days. It will always be free. Is there a limit to the number of users/projects with the Professional Plan? No, the number of users/projects is unlimited for Professional and Business. You can send out as many invitations as necessary. Find out more about how to invite a new user: click on how to invite new users. Remember that if you invite users with the Free account they will not be able to be involved in more than 2 projects at the same time. Is there a limit to the number of users/projects with the Free Plan? The number of users is limited by project with Free Plan. You can manage a team of up to 3 people per project. Do all the users working on the same project pay for the same plan? No, each user can use the Sinnaps plan that is most in line with their needs. There may even be some users who are paying and others who aren’t, depending on their needs. I am managing a project which involves a team with different roles: what plan should I use? Your ideal plan is: Professional. You can manage costs, resources and user authorisations, allowing each team member access to their specific functions. Don’t forget that each user can use the plan which best suits their needs. Not everyone in the team needs to use the same plan. What is the meaning of ‘PERT and CPM advanced planning tools’ in the free plan? 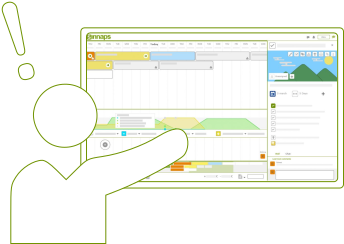 This means that, thanks to variations in the PERT and CPM techniques, Sinnaps automatically calculates the critical path for your work in real time, in accordance with project needs. What’s more, the app also replans after each modification. What are Earned Value tools? They are reports based on metrics used by the EVM (Earned Value Management). Earned value is a real-time continuous assessment of how the project is operating, compared to what is planned. Find out more about Earned Value or EVM techniques by clicking on this article. I tend to work with external clients and suppliers: can I invite them into a project? Yes. Everyone linked to a project can access your planning without this costing them anything. In fact, Sinnaps is designed for collaborative work through its management of authorisations. Your plan is: Professional. Click here to find out how to invite a new user. There is control over access to it. In other words, only the project owner can access the project – plus the users given permission by the owner. The information about the project remains secure and private. Access training and details of all functionalities at the Sinnaps Academy.